Summer SING! is a week-long children’s singing festival which encourages children to experience singing in Cork City. 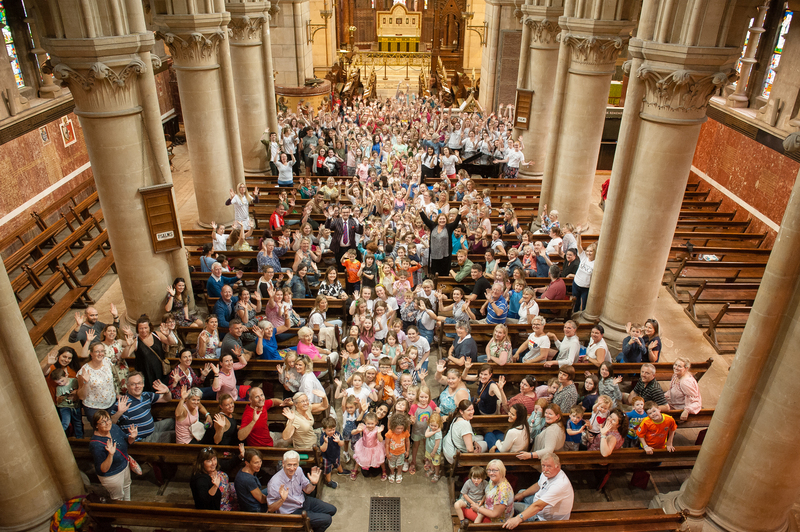 Some 200 children and 100 professional and volunteer staff, aged from 3 to 14 years, gather together and they sing in venues across the city. Every year St Fin Barre’s Cathedral is one of the key centres for the festival and on Wednesday 18th July the entire team met inside this wonderful singing space under the guidance of Peter Stobart, the Director of Music at St Fin Barre’s Cathedral. The festival’s founder and Creative Director is Sonya Keogh, who is also a parent of two boy choristers in the Cathedral Choir. This entry was posted in Cathedral, Cathedral Choir, Children's Work, Church Music, Cork, Diocesan Church Music Scheme, People from Cork, Summer, Youth Work. Bookmark the permalink.